The LaserMatrix from Output Technology is the market leader in continuous form laser printing. 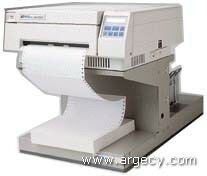 This laser printer delivers 16ppm of continuous forms, tags, tickets and labels with PCL 5 and Postscript emulations. It gives you the dependability and efficiency of a line printer with the flexibility and print quality of a laser...the perfect combination for your LAN. Its optional powered refolding stackers ensure the print job is always complete. The LaserMatrix delivers the ultimate in media control for your special applications: from patented forms length adjustment, to pinpoint registration and fuser temperature control, to on-demand printing for just-in-time manufacturing requirements. One year on-site service is standard. We want to put your laser to work, and keep it there. At Output Technology we are committed to being the price/performance leader. 35 scalable, resident fonts. Both style and metric compatible with the Apple? LaserWriter? fonts.